It’s more than a month since Adam Lambert’s latest single ‘Never Close Our Eyes’ made its way to digital retail here in Australia. Fans of the US singer snapped it up in sufficient copies at the time that it soared well into the upper echelons of the local iTunes singles charts. But now comes the news that Aussie Glamberts have been waiting patiently for, with Sony Music this morning officially servicing the track to Australian radio. The Bruno Mars/Dr.Luke penned track is the second to be lifted from the singer’s album ‘Trespassing’, which is in the shops this Friday. OK all you radio guys, where the hell is all the TRESPASSING signage? The only type I saw was at the council depot! and the songs on the radio. I went into JB HiFi to ask for Adam Lambert’s New Album and the silly girl said “Adam who?” Well. that put me in a mood!!! One radio station, that shall remain nameless, emailed me to say “it’s too commercial for this station” WTF there’re off my dial.Who seen the performance on IDOL? He totally owned it. The new songs are so different to Glamnation songs and a little bit harder to get used to, but after listening to them a couple of times and understanding the lyrics, can’t stop listening to them & watching Idol OMG. I too find it strange that a song is released but not advertised until a month later. Further, I don’t recall any promotion in Australia of Adam’s previous single Better Than I Know Myself. Let’s hope a lot more is done to advertise Adam’s new single and album. He did so well here with his For Your Entertainment singles and album. 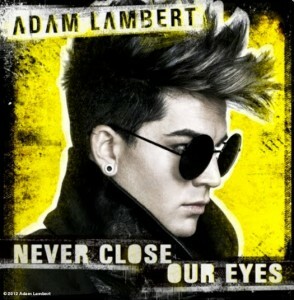 I hope there is huge Australian promotion of the single “Never Close Our Eyes” and the “Trespassing” album. They deserve to be heard on radio big time. Great, but I already have it. No remixes to entice me to help its chart position now. Is it just me that finds it strange to release a song but not advertise it until a month latter? I’m so excited for Adam’s Trespassing release. It’s totally different to his FYE album. The first half is electro-dance-dubstep-funk and the second comprises of ballads everyone can relate to. It’s a combo of fun, dark & intelligent content. The additional Deluxe tracks are amazing. There are no fillers on this album. Finally we get to hear it on the radio !